A U.S. District Court judge has taken the recent invitation of the Second Circuit Court of Appeals, and transferred to Oklahoma a lawsuit by Léone Meyer over ownership of a Camille Pissarro painting at the Fred Jones, Jr. Museum at the University of Oklahoma. The case will now proceed in Oklahoma, where the museum seems likely to assert both sovereign immunity under Oklahoma law, as well as an argument that transfers in Switzerland conferred legal title to the museum as a successor to those transfers. However counterintuitive it seems, it may yet be that a court could agree with Meyer that the painting was stolen, but agree with Oklahoma that a Swiss litigation in the 1950s about whether it was sold to a good faith buyer means that Oklahoma holds full title and ownership. An interesting development happened last week in the case seeking restitution of a Camille Pissarro painting held by the University of Oklahoma. The plaintiff Leone Meyer appealed the May 14, 2014 judgment that found that the courts of New York lacked jurisdiction over the Oklahoma-based defendants affiliated with the University of Oklahoma (the painting is in the Fred Jones, Jr. Museum of Art). Without ruling on the jurisdictional basis for dismissal, the 2nd Circuit Court of Appeals remanded the matter back to the trial court for consideration of whether the case should be transferred to Oklahoma. It seems likely that it will be, or even if not, that she will file a new case there and the matter will continue. It’s splitting hairs, but many of the headlines suggesting that the Court of Appeals had revived Meyer’s claims are not quite right; Meyer’s claims have still never been addressed on the merits (so they were never dead) and, as discussed below, another forum remains available to her. The larger point is that a second round is likely coming in Oklahoma. As we reported last week, the U.S. District Court dismissed claims against the Fred Jones, Jr. Museum of Art, the University of Oklahoma, and associated Oklahoma defendants, over title to the Camille Pissarro painting La bergère rentrent des moutons (a case in which I represented the David Findlay Jr. Gallery). 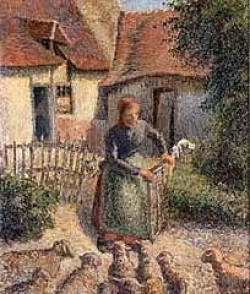 The U.S. District Court for the Southern District of New York has dismissed the much-publicized claims by Leone Meyer against the University of Oklahoma and related Oklahoma public officials and insitutions for the return of La bergère rentrent des moutons by Camille Pissarro, currently in the Fred Jones, Jr. Museum of Art. In full disclosure: I represented David Findlay, Jr., Inc. in the action, who was dismissed from the action last year by agreement.